Navel piercings are very popular, especially among young girls, teenagers, and young adults. They are generally pretty easy to heal, but that doesn't mean that they will always heal without complications. Some people experience infections, and others may experience migration (when the piercing slowly moves from its first location) or even rejection (when the body forces the jewelry out). Although navel piercings typically heal quickly, it is common for them to migrate or reject. Infection, metal allergies, scarring, tearing, and stretching are also common. Some people's bodies simply cannot heal successfully, no matter what. You just don't know how your body will react until you give it a try. The important thing is to make sure that you keep up with proper aftercare and wear proper jewelry, as this will help improve the odds of avoiding complications. Each of these issues is described fully below. Migration: What If My Piercing Moves? When a piercing migrates, it doesn't fully reject out of the body, but it changes from its original position. It may move just a little, or it may move completely away from the navel. If there is tissue damage around the piercing area. If there isn't enough tissue strength to hold and support the jewelry. If there was incorrect placement, such as if it was pierced too shallow or not absolutely perpendicular. If there is any friction, such as that caused by pants, belts, or shirts. If there is aggravated damage or trauma caused by hitting or pulling at the jewelry. If there is pressure, such as caused by another piece of jewelry from another piercing moving or putting pressure on the one in question. If your body grows: If you got the piercing when you were young and your body was not fully developed, or if you gain weight or become pregnant, as your body changes and alters, the piercing will, too, potentially causing migration. There's nothing that you can really do to stop migration, but you can impede it by avoiding the potential causes listed above. If you see signs of migration, you'll want to remove the jewelry, let it heal, and then try to get re-pierced. What Causes Rejection or Migration? Heavy, thin-gauge jewelry made of the wrong material can cause rejection or migration. Rejection: What If My Body Rejects the Jewelry? If it continues to migrate, it may actually be rejecting, which is when your body pushes the jewelry out in an attempt to heal itself. Just like the body would force out a splinter, it will force out jewelry, which is a foreign material, and the body doesn't like foreign objects to be inserted into it. Some people just can't heal navel piercings. Some repeatedly try, but each time, it rejects or starts to migrate. Scar on top hole and keloid on the bottom hole. Scar left behind from migration/rejection. The barbell will appear longer. The fistula will become shallower. The holes of the piercing will move. There will typically be a trail from where the holes were originally placed to where they are now. There may be redness or scarring around the holes. The jewelry may start to hang differently. There may be some sensitivity in the area, but it typically will not hurt. The hole may appear larger than before. The skin between the two holes may start to appear thin and see-through. Unfortunately, there's nothing that can be done to stop rejection. The best thing to do is to just remove the jewelry, let it heal, and try to have it re-pierced again. If you do not remove the jewelry, you will be left with a nice scar. In some cases, the body will completely reject the jewelry and force the barbell out completely. The good thing is that rejection doesn't hurt. And no, your piercing doesn't have to be infected to be migrating or rejecting. Infection: What Are the Signs? Bacterial infections most often occur soon after the piercing, but can happen any time. It could be the result of poor aftercare, unsanitary conditions, a reaction to the jewelry, or an untended rip or tear. Usually you'll see swelling and redness in the area and it will feel painful and perhaps hot to the touch. The swelling may become a boil or an abscess. You may see a discharge of pus (clear, white, yellow, brown, or green) that might dry to a crust. If left untreated, you might even have a fever, chills, and other flu-like symptoms. Red lines radiating from your belly button. A thorough cleaning regime and antibiotic treatment will be necessary. If it's exacerbated by a reaction to the jewelry, you may need to change it out to something made of titanium or implant-grade surgical steel, but it's best to not remove the jewelry (or to touch or fiddle with the piercing with your fingers, which may be dirty). Scarring: Can I Avoid It? Some scarring is unavoidable, since the skin around any piercing rarely heals to look exactly as it did before. The piercing itself is a scar, after all. But sometimes—depending on the location, the person, and other factors—scarring is more dramatic than others. Hypertrophic scarring is a common risk, and keloid scars can happen to anyone, but those with darker skin pigmentation are more susceptible. Keloid scars look like overgrown red-and-purple mounds of fibrous scar tissue that feel hard and smooth to the touch and can appear at either end of the fistula. They are often itchy and can sometimes be tender and slow to heal. Metal Reaction: What If My Body Is Allergic to the Jewelry? Many people experience sensitivities or allergies to various metals. Of course, there is some cool, cheap, good-looking jewelry out there, but it's not worth the risk. A reaction to jewelry can be the thing that triggers an infection which, in turn, triggers rejection or migration and eventually losing the piercing. If you're just a little allergic, you might experience some itching, redness, and irritation, but a major sensitivity will lead to a painfully itchy, bright red, swollen, throbbing, pus-filled mess. Your skin may pull back from the irritation, causing the piercing hole to gape. If you think you might be sensitive to the jewelry, immediately take it out and replace it with something more biocompatible. Wearing a curved barbell (instead of a ring) until you've completely healed might reduce the risks. What Else Could Go Wrong? Tearing, Stretching, Etc. Excessive bleeding and nerve damage: This can be caused by an inexperienced body piercer that pierces too close to a nerve. Over-cleaning: It is possible to hurt the tissue with too much cleaning. Don't overdo it! Follow your piercer's instructions. Changing the jewelry too soon: Another common no-no. It can take eight weeks to six months before you are healed enough to fiddle with jewelry. Again, follow your piercer's instructions. Frictional irritation: Sometimes the friction from your clothing or waistband may irritate and delay healing. 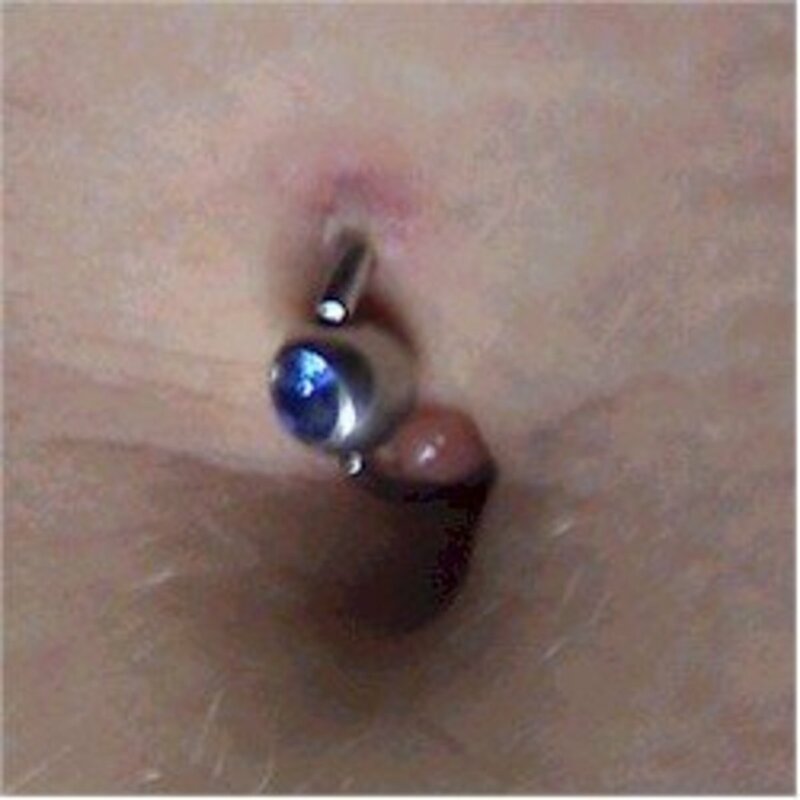 Tearing: Navel piercings are less likely to tear than those in other spots (like the ears), but it is possible for jewelry to get caught and tear. Stretching: If a piercing is too shallow or close to the edge, a stretch may enlarge it too much. Heavy jewelry, tears, rejection, and migration can alter the shape of the fistula. Some people have to have the doctor fix the hole by sewing it smaller. Bacterial endocarditis or infective endocarditis (IE): If you suffer from congenital heart disease and you're exposed to bacteria via piercing, you're at risk, and it could even be fatal. This is why reputable, professional piercers ask you about your heart before they do anything. Use saline solution or non-iodized sea salt (not table salt). If you opt for sea salt, mix about 6 ounces of water with about 1/2 teaspoon of sea salt. Pour enough saline or sea salt mix into a cup (the disposable bathroom dixie cups work great). Gently place the cup over the navel, lay back, and let it soak for about 10-15 minutes. You want to do this about twice a day for the first several weeks. After that, once a day until the piercing is healed. You want to avoid using strong products such as rubbing alcohol and hydrogen peroxide. Also, try to avoid using any creams or ointments. It may seem to be healed in 4 to 6 weeks, but it can take 3 to 6 months and sometimes even up to a year for a navel piercing to heal completely. I had my belly piercing for a week now I woke up by tearing it a little. And cleaned it after it was painful but the pain went away. Can that still lead to infection? I’ve had my piercing for about a year now and the bottoms hole right under the piercing has a red weird bump thing and a blister under it what is it? And what do I do? Please help me ASAP! Is it normal for my belly piercing to be black at the top and bottom after 4 months? Ive had my belly pierced for about 6 months now and my skin around the 2 holes are purplish red color. What does that mean? It doesn't hurt but it still crusts. i got my belly piercing a little under a month and its a little swollen around the piercing holes and also the barbell is a little loose. doe it mean its healing? In the picture of Migration the skin where the piercing was made looks to be a darker than the areas around the belly button....is there a way of getting rid of that color? I got my navel pierced two months ago and it shows no signs of rejection or infection but around the top hole is really dark what could have caused this ? I got my piercing in like March or April and I took it out for a night and it’s like a ball on the In side & the whole is not letting me get through whyyy and what do I doo ?? i got my belly button pierced in november and there was some sort of scaring behind it that i never really noticed until this morning i woke up it was really sore and i looked at it. my piercing is fully healed and fine but behind it the scar tissue poped or somethng and there is a hole in it ? has anyone experiencede this? What should i do if my belly button piercing is getting too small do i get a bigger one ? I just got my belly pieced almost two weeks ago and everything seems to be going fine no pain no swelling no soreness I an sleep on it comfortabley and clean it regularly but there is puss when I move it Checking it out seems to just ooze so I pinch it all out there is no pain during nor afterwards and this just started two days ago it so is this part of healing ? I had an inny-belly button... now that I’ve gotten this done....it looks like I have an outty-belly button...help!!!!! I legit got mine yesterday and yesterday it was bleeding,also right now when I woke up . Is that bad or am I just overreacting? i got mine about two weeks ago and now its red and scabbed, is that normal ?? ive been sleeping on my piercing and i just got 4 days ago and my ball created a bigger whole should i be worried? I have my belly button peirced for about 2 months,I have taken it out twice but put it back in straight away,It's really sore if I bend over or touch it,There's a peice of crust growing out of the peircing hanging on by a blood kind of thing,I can't get rid of the crust as it's really sore,Someone help? This was very informative. I did mine and I experienced the itching (which I kw as healing once), the tiny bites of pain if pressed against it, pus....then migration and rejection. The skin got so thin I just raised up the ring, which burst out with ease like it was just resting there waiting to be picked up. So now I'm thinking about trying it out again, it came out 2015. I've had my belly button pierced for about a year and a half now. I took it out a day ago because it has really been irritating me. Now I can't put it back in...help! I've had my navel done for over a year now and it's only recently healed but it's went to thin and I'm scared I don't want it to rip! Is it rejecting it? If it's healed will it just stay like that? I got my navel piercing about two months ago. About a week ago I was changing it for the fourth time, back to the ring I was pierced with, and I found that it was very difficult to push the ring through to the point that I thought it was closing. I haven't changed it since then but I have it in upside down because I didn't want it to close and I didn't know what to do. I don't want to change it but I do want to put it in right side up and it's still really tight and I'm still afraid it will close. I got my naval pierced (top part) and its a little red (people say that's normal), a little crusty (people also say that's normal), VERY little puss every once in a while, and I see a little yellow colored piece of crusty in the top whole next to the jewelry, and occasionally its itchy but like an inch away from the piercing (doesn't itching mean that its healing?)... is all this normal? is it rejecting? Am I allergic? is it infected? is it normal? If you did them yourself with a sewing needle, you used a smaller gauge than what is typically used. That's about a 20 gauge needle. Generally, lobes are pierced at 16 gauge. I did my piercing myself and my skin is trying to heal on top of the, not bar or the ball on top, but the jewelry piece. Right now I'm cleaning it and caring for it with an anti bacterial soap bar of Dial and it's helped a lot, but the skin is still trying to heal on the jewelry piece. Is this bad or no? I had a belly button piercing before and there's a scar kinda like now, is it okay to get it re-pierced ? I just got my bottom belly button done in January and it was fine until now there puss coming out of the hole and it's very sore I just took the belly buttom out last night to clean it because it was hurting so bad I have a like a big bubble at the top hole of the piercing. Does this mean it rejected the piercing or is it infected? I can't put it back in because it's hurts too much to. I've had my belly button done for about a year now and it's been fine so I decided to change it. The first time I change it everything was all good until it started hurting being tender pussing so I decided to put my original jewelry back in and it felt better and it went back to being fine so I thought ohhh maybe that jewelry was fake or not good quality so I left it alone for months and I bought some other jewelry a better kind the one I thought I was pierced with so I changed it and it was fine it didn't hurt me or nothing I've had that jewelry in for about a week until now it started being tender and pussing so I changed it back to my original jewelry but I don't know what's happening can anyone help me?? how can i tell if it's rejecting ? i snagged it and it kinda tore but it is only red at the top and ian very sensitive anymore ? Hey, I had my navel pierced six years ago, the piercing was rejected and I was left with a nasty scar. I love navel piercings, couldn't resist and got another one done two years after that. This time again , it began showing signs of rejecting and I had to remove it. Scarring again. its been three years now, I want to try again. Dont know if I should... really want it though. this will be my last attempt. Any tips anyone?? I saw someone stated "no table salt" Omg imma go nuts now cause that's what I've been using twice each day. Please tell me it's not going to end horribly. And why can I feel the ring between the two ends of the piercing? If i have had the top done for two years and i just got the bottom one done is it likely to reject ? I have had mine done since December and it was fine at first and then I put in a new piercing in it was sore and the guy said it would go away and it was fine a couple weeks went by and I didn't watch it and a scab started to grow around the ring itself I tried cleaning it but it hurt to much and so I went to him he took the one I had out and since I'm allergic to certain medals I have a gold one now the other one left behind a small bump and he said if I clean it with antibacterial soap I have been and its been 3 days since I got it checked on and the bump has gone away but it's still sore and oozing yellow puss should I take it out or see if it will heal and is it rejecting it? i had my belly button pierced 2 wks ago and it got really red 2 or 3 days ago. I didn't think it looked right so I called my piercer and emailed him my pic of it and he said to get in right away. When he saw it in person he said that has to come out. Was that the right thing to do? I don't know if i was allergic to the jewelry or if he took to much skin out but he said he has never seen this before. The top of the barbell had a diamond and it was going into my skin kind of making a hole. I am not sure if mine is migrating or rejection. I've had my belly pierced twice. The first time I had to take it out because it would turn completely to the side (to the left) and it was irritating my skin to the point it would bleed. I have so much scar tissue now because of that. I waited 3 years to re pierce it. There is a horizontal scar in the middle of both holes that appeared after I had a minor infection when it first was peirced. the peircing does not seem to be any closer to the surface than it was before. I've had it for over a year with no problems but now the top hole looks like it is stretched a bit (not sure about the bottom) so its pointing to the left again and I can feel it putting pressure on my skin some times. I usually take it out for a little so the top hole goes back to normal. Does anyone else have this problem? and is it migrating or rejecting? hi i had my belly piercing for the first time and i notice that the piercing was hanging but i though it was ok because was my first time so about two days i had just a thin layer os skin in the middle and it came right out so i waited and went to another place ill be a month now lets see what happens ill let you posted wish me luck. hi, my belly ring is currently rejecting. my skin is realllllyy thin. but i want to keep it in for 2 more weeks just to go on vacation, is that bad if i do?! Hello =] Had my belly button pierced about 4 months ago and everything has gone really well so far =] its my seventh piercing and, lucky me, nothing has ever gotten infected, migrated or rejected. However my advice would be to do plenty of research about your intended piercing beforehand. Make sure you go to a reputable place. And stick to the aftercare routine! The advice on this page is really helpful too. I'd also suggest that the youger generation wait until you're 18+ for any piercings other than ears. I came home when I was 14 with a nose ring and my mum went spare =/ also, you're body is still changing etc and it'll save stressing out your parents =] Other than that enjoy having a piercing, look after it properly and you should have no problems. Feeling self destructive so I get the navel pierced. Now I have this nasty pussing hole to look at. nice. very attractive. Okay so my belly button ripped a little. I don't know what to do! i really don't want it too be crooked! I had mine done by a professional, but in the end it rejected. It healed nicely over 3 months, no pain or any problems, so I thought I was healing great. But then it got slightly painful a few days out of the week, and I randomly checked it and it was only being held in by a tiny bit of skin. Luckily, I don't have a scar, just a little red bumb that is healing.. I don't think my piercing was done deep enough/long enough from the beginning. So. I need help. I got my belly peirced back in March of this year, and it started to scab. So I picked off the scab and now the skin in the middle of the peircing looks very smaller than it did. I don't know what to do. hi..im 15 is there anyway i can take my belly ring out and soak it in sea salt n put it back in after a weak but keep soaking it in sea salt??? help! How long should one wait before getting their belly button re-pierced? It healed well the first time, it just wasn't peirced deep enough. My mistake was that I didn't go to a professional.. my friend did mine. She's very very sterile and has done hundreds of others piercings. Its extremely infected tthough :( I think its rejecting. Just got it done last week. Hole on top is pusing and its almost as big as the ball. It's a ring.. I should've done a barbell that way I could move it and there wouldn't be a huge knot. Can I change the ring to a barbell? mY daughter had her stomach pierced and her body has just rejected it. Melissa i have the same problem its been pierced now for 3months and its starting to reject it again. I had my belly button pierced a few years ago. For two years I fought the infection and it eventually pushed itself out to the point of a thin layer of skin holding the jewelry in. I took it out and let it heal. Now I have a thick scar in place of the piercing. I want to get it pierced again and was wondering if the scar would keep the next one from pushing out, being that the skin is thicker now. A lot of times if a piercing rejects, putting a real gold barbell in it will allow it to heal. I've had a few friends who's rejected, but healed whenever they used a gold bar. It's called rejection. I have one just fine. My first migrated, but the replacement has been fine. I got mine initially when I had my upper navel pierced, which is what caused the migration. I haven't had the upper one repierced, which is why I believe the lower has stayed this time. I've had mine for years. Some people are just prone to rejection. I had a lower belly piercing and it rejected - the skin just got thinner and thinner until I could see the ring and then one day just split in the bath! It didn't hurt a bit and healed just fine. Another piercer told me that very few women can keep a lower piercing - you have to have a really tight and flat belly - I guess Gwen Stefani could do it! But us mere ordinary women cannot. I have been tempted to have a belly button piercing but I have heard of some problems that put me off. Maybe one day I will do it. Nice hub. hi whitney ive had my belly button pierced for almost 8 months now, but its starting to hurt and its sore in the middle of it, is it infected or is it rejecting the piercing please help? Tongue -- the only way to go. Wonderful work! I used to have a navel piercing years ago but my body rejected it in a month.then i had it re-pierced after it healed all the way,i had the same problem again. 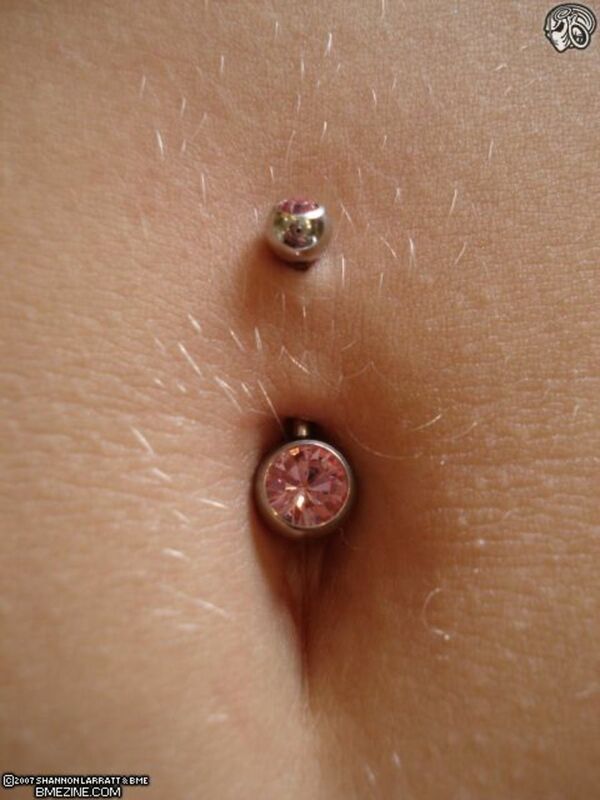 i guess im one of those people who are not meant to have a navel piercing.